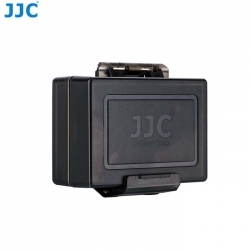 JJC BC Series Multi-Function Battery Case is not only a battery case but also a memory card case. Made of high quality PC material, the battery case is sturdy and durable. It can store selected batteries and extra memory cards. The battery case can provide your battery with a better protection, and make it away from short circuit. The interior cotton pad also can effectively prevent your memory cards from damaging. In addition, the water and debris will not get into the case owing to the water-resistant seal. The battery case is light weight for easily carrying. A part of compatible battery models of BC-UN2 battery case were listed at the following for references.